Last Monday I shared my all-paper mantelscape. Remember?? And, on that mantelscape was a handful of paper flowers, of varying sizes. I've had some requests for a paper flower tutorial..and, today's the day I give you just that! Don't worry. It's a painless process. All you need is a stack of old book pages (or any paper, really), a hot glue gun and a rectangle of cardboard. 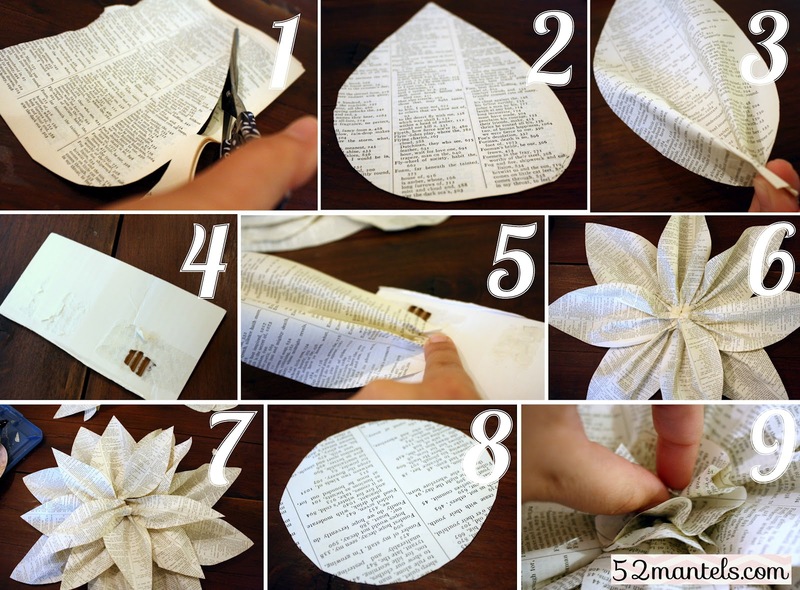 1-2) start with a stack of book pages (10-12 sheets) and cut a free-hand petal shape (or rain drop shape. or tear drop shape. or leaf shape. or...well, you get the idea) 3) take one petal and pinch or gather the rounded end 4-5) hot glue the gathered petal's end onto the edge of your cardboard rectangle 6-7) working in a circle, glue petals down one at a time 8) when you have your desired number of petals, take another 2-3 pages and cut freehand circles 9) place a small dot of hot glue into the center of your flower and press a circle into the glue, giving it a little pinch as you do. Repeat this step one to two times. 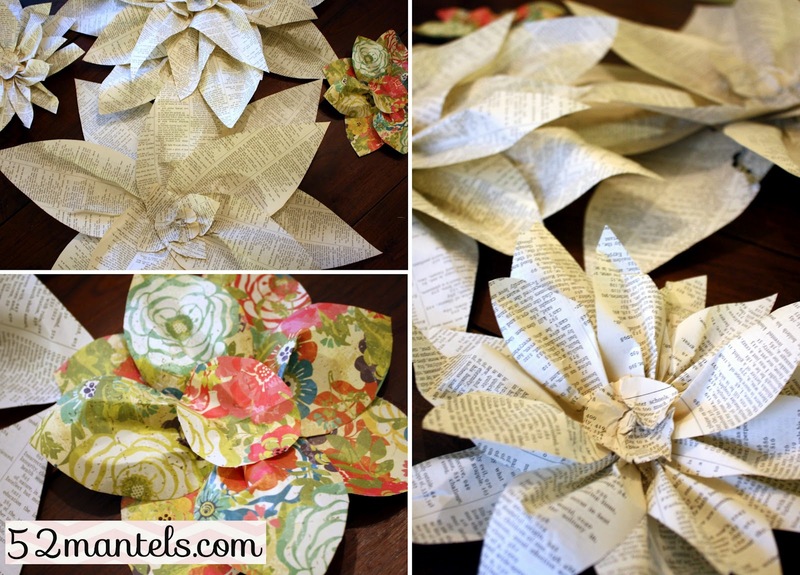 I did this process with old book pages as well as scrapbook papers. The size of your flowers will depend on the size and quantity of your petals. The largest flowers featured 12-16 5" petals and the smallest flower used 8 2" petals. These are completely customizable. Unless you burn your fingers with the darn hot glue. Which I only did twice (ish). 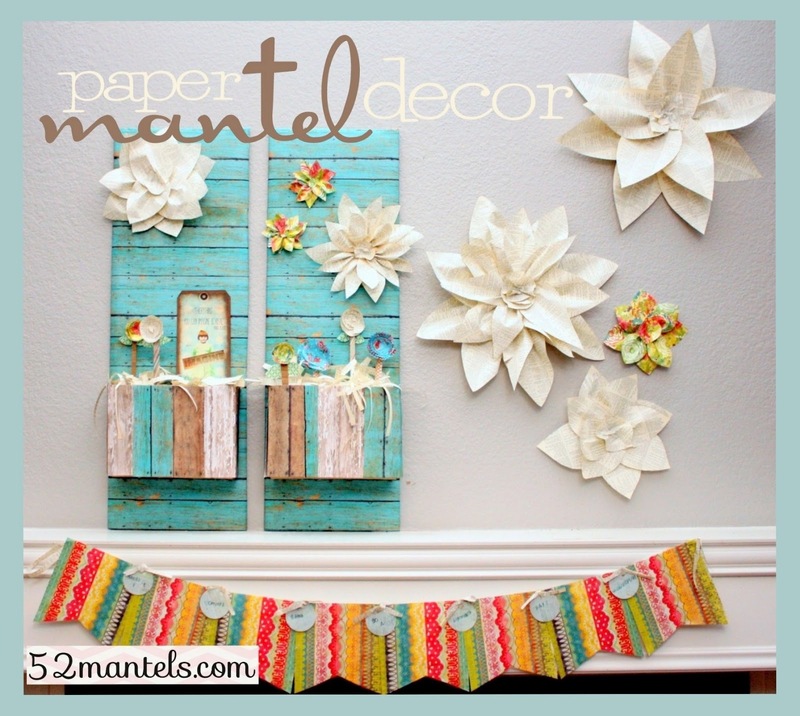 If you haven't yet, go check out my 100% paper mantel! I love the look of this. Thanks for the directions. Great tutorial! I am going to use it to make some red and white flowers for the upcoming Canada day holiday! Thanks for sharing. Emily, these flowers are so pretty. I love how simple they are. I've got a hallway wall just screaming for something. I'm pinning these. They just might be what I end up using! Thanks for sharing! I'll pin this for my girls to make. Me? I heard Marie Osmond's old song in my head when I read the title...... Paper Roses. Yuck. Wow! I love your blog! You have some amazing talent! I have a LARGE shelf in my kitchen that I am constantly decorating. There are so many great ideas on here. Thanks!! Beautiful - I can picture my girls play room covered in these beauties!! Pinning so I can make these! Love the paper flowers! Your all paper mantle is beautiful! 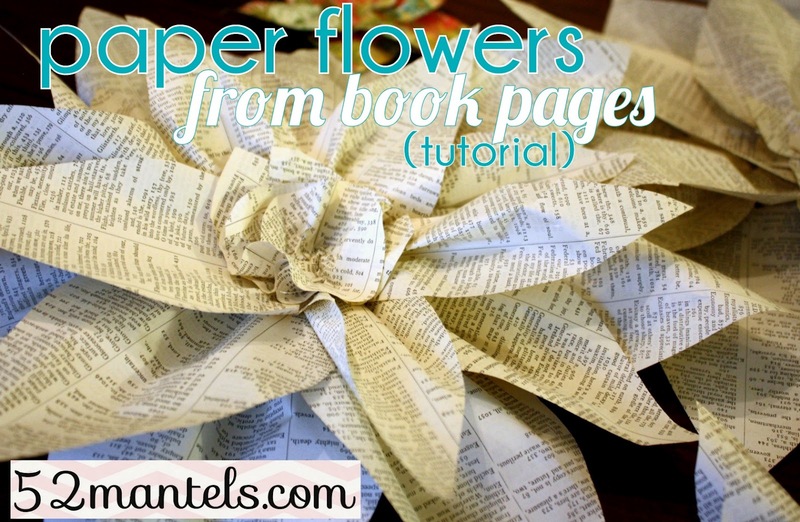 I'm always looking for good paper flower tutorials. Thanks! Those are pretty. I like the Mantel too.